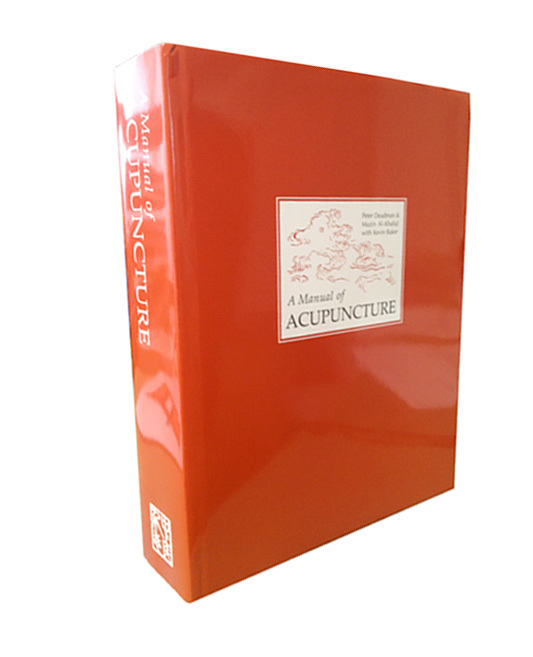 I was approached in around 1990 by a publisher who wondered if I wanted to write an acupuncture points book. I declined because I thought that there were already too many on the market. Some time later I was talking to a friend who pointed out that the fact there were so many meant that there was a significant demand. I then began to conceive the idea of a book that offered much more than anything I’d yet seen. The next step was to assemble a team. I ended up working with my close friend Mazin Al-Khafaji on the Chinese medicine part of the book and with a friend and colleague – Kevin Baker – on the point locations and illustrations. Mazin translated classical point indications from a variety of textbooks, as well as any commentaries and quotations (he had to educate himself in classical Chinese to achieve this) and together we wrote the point commentaries which are at the heart of the book. We met just about every week for eight years. The work that Kevin and I did was similarly exacting – again consulting numerous books and deciding on the best way to describe the point locations, followed by the careful commissioning of core illustrations. I later spent many hundreds of hours in front of the computer, turning these core illustrations into the point illustrations. As the book neared completion, I devoted myself full time to it for about a year – writing the introductory chapters, choosing the typography style under the guidance of John Chippindale, as well as deciding on paper, binding, cover etc. We tried to be equally fastidious about every single aspect of the book (for example spending a long time on layout to try and ensure that wherever possible the point location and point illustration were on the same page). Within a year or two of its publication, A Manual of Acupuncture became the standard points text throughout the English-speaking world. As well as the textbook (now also translated into German, French, Italian, Czech and Portuguese) it is currently available as a Point Cards Set, a Multimedia DVD, a smartphone/tablet app (Apple & Android) and an online app. First of all, I would like to say, that I love your acupuncture book. I have heard, that you have a great application for iPhone, and I am wondering if you have any plans of making a version of android? One of the reasons I searched for this thread is after reading latest tech news on how Android has overtaken Apple in tablets. (http://www.maximumpc.com/numbers_android_king_tablet_market2013) and this is just going to keep on happening. First phones, now tablets. More Android devices out there and your developers are shutting you out of a HUGE market share that can bring substantial revenues. I honestly do not see their reasoning for piracy on Android issue as the people who pirate will pirate and not much is going to stop them. My experience in combating piracy involves working 8 years for a major game publisher that shall remain nameless. Hello. I have the text and the CDs/DVDs. Classmates with more income bought iPads and the app for that shows excellent video of point location and needling technique not on the CDs/DVDs. Will your web version have the video imaging available? I don’t have extra money for an iPad, but if that has been the only way to get those useful videos. I do hope that aspect of the application is expanded to the PC world, and perhaps the Android world. I consider your book one of the most complete and well written on acupuncture. I have a question regarding the names of the yin channels. Jue means “between two”. In the case of the yin channels of the hand is correctly named but in the case of the yin channels of the foot the liver channel is more lateral/external (more yang) than the spleen channel so shouldn’t be caled jueyin. The speen channel is between the kidney channel and the liver channel and should be called jueyin (between two). Dear Sofia, I am a chinese and would like to add in some words. Jue does not mean “in between”(I don’t know where you get that from). It means “the end of something”. In Shang Han Lun, jue yin means that the illness has progressed to the end(critical stage)-The patient is going to die. In normal yin yang functioning, it also refers to the the end(extreme) of yin. I am a professor who loves to use your app on my Iphone. I have been waiting to buy a new phone (Android) since Jully. Any news of an app for Android yet? The Android phones are selling 3 to 1 with I Phone now. Looking forward to hear from you. Thank you ! Hi Tim. Our developers have advised us that Android apps are too easily hackable so it doesn’t look like we’ll be doing this. I think it’s a mistake because there are a lot of android users and we we’ll enjoy this app. I think there must be any way to avoid hackers because there are a lot of good apps on android store (google play) and many of them are not free (skyscape’s washington manual, sanford guide…). In my group of acupuncture learners there are a lot of sad android users that can’t use your program on android devices. Actually, we have reconsidered and have decided to publish an Android app. Unfortunately these things seem to take more time than one hopes but this will happen. Really? An idea when the android app may come through? This is the best news I’ve heard all day!! I’ve been so bummed the app is not available on android. I have no intention of switching to iPad and want the app desperately! Well, here’s the latest … We don’t have a date on the Android app yet as we are still waiting for the long-delayed launch of the Apple app upgrade (it’s close). The Android app is due to follow. BUT!!! the same developers are working on the upgrade to the Manual DVDRom which no longer functions on the latest Apple & Windows OS. After much discussion, we have decided that we will no longer publish this as a DVD but as a web-based application. This is the all-singing all-dancing digital version of the Manual (entire text, point locations videos, multiple test functions etc.). The upside of it being a web-based application is that it can be accessed on any device that has a browser, it can be updated easily, the videos can be high quality and it won’t suffer from OS upgrades. The only downside is that users will need broadband to use it. We are hoping for a July launch. Thank you so much for an amazing text. I am a first year student and I own your book and find it to be the best choice for my studies. I also purchased the CD Rom for a windows computer so that I could watch the videos for point location. I have now purchased an IPad and am wondering if there is any practical way to move the information to it without purchasing the information for a 3rd time. I purchased the CD Rom key last month. Thank you for your assistance! I notice that there are two editions of your book. Are there important changes that were made to the new edition, or would I be fine with the blue (older) one? Every printing (we’ve had about 10) has had some changes made to it – mostly minor. The only difference apart from that between the blue & orange versions is internal colour. I agree with Tim, there are hackers for both systems, but people who are more into computers choose Android, as they are better than apples’ itunes. Please give Android users the possibility of enjoying your work too! I am a student of acupuncture and am interested in patients drugged … and those who use alcohol, crack, cigarettes … and in your manual I could not find acupuncture points for addictions / abstinence…Do you have some points in the book? and I did not know to look? or use some right now with this purpose and can give me a hand? Hi Peter, will there be a full version of ‘A Manual of Acupuncture’ available for download or is it only available via the iPad app for the points or via DVD? Many thanks and best wishes for a great 2013. Sorry,, I should have said that I only have an iPad2 and a very old pretty much defunct iMac to work with. Please could you advise if possible, when the app of the book will be out for android? Peter sorry if I am being repetitive of comments above, but I’m just unsure – is it sufficient that students only buy the Ipad App or, to be complete, is the book also useful? I’ve bought the app and our College seems to be suggesting we don’t need both, and I also don’t have the $$$ to throw around. Will it usually be sufficient just to have the app? Hope it does not stress you to much. I’ve finally purchased your manual text version and was thrilled to find a bookmark enclosed advertising an app version available for apple users. However, I’ve been trying to find one with no such luck. I’ve searched the App Store for both iPad and iPhone versions under your name as well as the book title and haven’t come up with anything. My apologies. Yes, I had seen that app when searching last time. however, i was expecting the app logo to look similar to your book cover and when searching for ‘Peter Deadman’ hadn’t yielded any results I’d assumed that it wasn’t yours. I should’ve opened the app details and I would have recognized the illustrations. These mobile versions will be very convenient to have close at hand. Dear Mr Deadman, have there been any further considerations for developing an android app? I am currently an acupuncture student and have your hard cover book, an app for my tablet would be such a great benefit to my studies. Maybe because it’s a new technology or maybe we’ve just had bad luck but we have been having a tough time with our app developers. We had to sack one lot because of failure to deliver, their replacements decided after a few months they couldn’t manage the job and we are on our third now. Fingers crossed. At the moment our priority is to get the promised iPhone/ipad upgrade out but as soon as that’s done we will ask about Android. Apologies for the delay. I’ve downloaded the trial version of the Journal. Unfortunatly the videos aren’t working. I’d love to see them before I buy it! I absolutely Love your acupuncture book. Could you please, please please, Make an android app? I saw the iphone app on my lecturers phone. It is simply AMAZING!!! Could you get a second opinion with other app developers?? Surely there is someone out there able to make a secure app that can’t be pirated (pirated things are of very poor quality… any student of acupuncture would buy it not pirate it). If there is a will, a way can be found. I can’t afford an iphone as a student, it makes no sense for me to buy another phone only for this app. Peter, my wife teaches acupuncture in Toronto and most of her students use your manual as their major reference. Unfortunately she has an Android phone. I applaud your strategy of developing a web app. She could then use a tablet device to access your materials. I have to ask… Has any tentative release date been set? Thanks for the good news! Next course starts in September for the school so there is hope. we are writing about Acupuncture points for a blog and also want to have a drawing/picture of this point. Is it possible to use your drawings for that? And how does that work where and how can we buy the rights to use your points? I have recently puchased your Manual of Acupuncture app, and can’t see any way of easily finding the Source points, Shu points, etc. Are these listed anywhere, or is there some way of searching for them? I am a student of Acupressure and I’m trying to get hold of your book, A Manual of Acupuncture. I have found it for a good price through Amazon Books, but they cannot deliver it to me unfortunately (i live in Western Australia). Are you able to give me any suggestions as to how i can get hold of this book at a good price? Great news about getting the app ready for android! I am looking forward to getting it there! Thanks! By the way, what is the problem with getting it on the marked? Thanks for all your and your team’s efforts to far. A Manual of Acupuncture has been a great resource for me and many others. Would you please give your latest estimate of the release timing for the new web app? Your book is one of the best out there and e-version has been a real help while studying. But as the market change and I now have to upgrade my electronincs. I wonder where I can find the much talked about android web based version. ?? Any news about when it’s out on the market. Hope to soon install it on my tablet and phone. Great news you come with Peter. Looking forward to February and the Android platform you’ll be launching then. Thanks and best wishes for a great year. I sure hope that you will do it, since the market is doing a 180 and hittinig over 70% of the users that are Android. Once you have the Android you’ll get a huge customer crowd from Europe. Hi Peter, are you aware that the ios app has a bug? On my iPhone 4 and iPad 2 it does not use the whole screen. That’s no problem on the ipad but it is a nuisance on the iPhone. Will there be a fix soon? Any new estimate for the availability of the Manual of Acupuncture web application? I know you are all doing your best. I hope someday to use it not only to further my own education, but also to help people whom I will lead in Qigong classes and/or for whom I will do Acutonics treatment to expand their awareness. Please note: We cannot guarantee functionality and/or a quality user-experience if you run this app in any unsupported browsers or on devices with screens smaller than recommended. The App runs in Firefox with the exception of video playback functionality. The next release will fully support Firefox and Chrome for Mobile. I’m pretty much screwed. I have both the hardcover book and study point cards. But I have an android system that I use TCM Clinic Aid on. Your points have been pulled from that app because of your new product, yet I don’t have access to it. As a student, I can’t afford to purchase new systems just to get access to this. Do you have any viable suggestions? Dear Peter, it is mid- February now and I desperately need the app for an android phone or a laptop. When will it be available? I am an acupuncture student and was wondering how you and your co-authors decided to depict the meridians in A Manual of Acupuncture; that is, what source material did you use and why? I have subscribed to your excellent PC version of amanualofacupuncture. but now I cannot login to the site http://amanualofacupuncture.com/ so I cannot see what is wrong. If you have shut down the site, will I get a refund? Our tech team says they replied the next day and suggest you check your junk folder. I am back on line now! There was/is a bug on the app which means you cannot see any of the videos (on the PC version). I reported this to the support address you mentioned , but they ignored my emails altogether??? I have converted to the outright purchase version, but I have had no confirmation to my email address, is that normal? I was wondering how can I read your manual if my WiFi goes down? I have also asked the support address above about the video issue and they still haven’t replied, or is there a problem wiht taht email address? You use yin and yang in (at least) three ways in the Manual. I’m struggling to understand the third use and am hoping you might clarify. First, the terms are used as positive adjectives. Second, they’re used as comparative adjectives. And third. they’re used as nouns. This third use suggests yin and yang are substances. If they are, I’d be most grateful if you could clarify exactly what substances they are! I’m sorry to trouble you with this problem, concerning the purchase of a license to the online version of A manual and Acupuncture, but I do not know how else to go about it. I have already bought the iPhone version, but would also really like to buy a license for the online version for my laptop. I have repeatedly entered the card details on the website, but then nothing happens. I have also contacted the support several times, also without success. I therefore ask you if you have heard of or know of any difficulties in buying a license to the online version, and perhaps also know the solution? I seached the app of A Manual of acupuncture on Google play store, but I didn’t find it. The Android version still available or not? Thanks. I think that the problem is with my tablet version (Nexus 7, Android 5.0.2). Unfortunely, the Manual app is incompatible with that device. Do you to lauch an upgrade of the app? I think that the problem is with android 5.0 version, not with the device. I think that the app needs an update as soon as possible. Hi Segi. I’ve passed this on to our developers for comments and will get back to you and Melanie. Hi Sergi. I have spoken to our developers. They think this is an easy glitch to fix (they have the app working fine on 5.02 in their office) and will post a new version up next week which they hope will overcome the problem. Hi Melanie. I’ve passed this on to our developers for comments and will get back to you. Hi Melanie. I have spoken to our developers. They think this is an easy glitch to fix (they have the app working fine on 5.02 in their office) and will post a new version up next week which they hope will overcome the problem. Thanks a lot Mr Deadman. I’m look forward to use the app! From March 20th there’s a new version of the app, but when I try to install it, after installing more than 800mb, when I launch the app it stops and only shows a window with the message ”downloading applets” and nothing else happens. No I didn’t try it yet this version. I let you know if I can use it or not. I have Manual of acupuncture – for android,english version 2.1.32. There are some problems in this version. – I am not able to register (when I touch Register – there is no response from the aplication). – Missing pictures in section Point applications and needling. Can you resolve this problem? I have the Manual of Acupuncture Flashcards but all my lung meridian cards recently have been damaged. I was wondering if it was possible to get replacement cards or would I have to buy the whole set again? Dear mister Deadman, I have been using your book, DVD-Rom and application for quite some time now and I am very happy with it. I recently purchased a new laptop with Windows 10 Home and it seems I can not run your program. The installation is no problem, but after I try to run it it keeps hanging with Loading… After a few seconds it shows the error: ‘The projecter file is corrupt’. Of course Quicktime is installed. Is your program still compatible with the latest Windows? The DVD is 7 years old now and says it’s compatible with Vista, that’s been quick some time ago now. I’m having a similar problem. I have a downloaded version bought last year. This worked on my windows 10 upgraded computer, but it won’t install on my new surface. I work in a WiFi free zone, so the online version isn’t useful for me. I would like to try a fresh download version, but the link no longer works. Kudos and Thank you for the brilliant Manual of Acupuncture and mobile app version !!! My classmates and I are part-time 1st year students at Hongkong University Chinese Med school. Yesterday I purchased the digital version from my iphone because I realised I much prefer not to carry the manual around for the next 2.5 months of my Summer school holiday. I also realize that I find the iphone screen is too small for good reading. Upon reading the posts here, it appears that the digital version on my iphone is less comprehensive than the online version. As a new student to this course, I think I will need a more comprehensive version. Sorry if this seems a silly question but is it possible for me to access the online version on my desktop in my office since I had already purchased your digital version because I tend to do most of my study and revision during my work breaks. Thank you again for opening the gates to my mind!! Is there a difference between the orange cover and the black/blue?